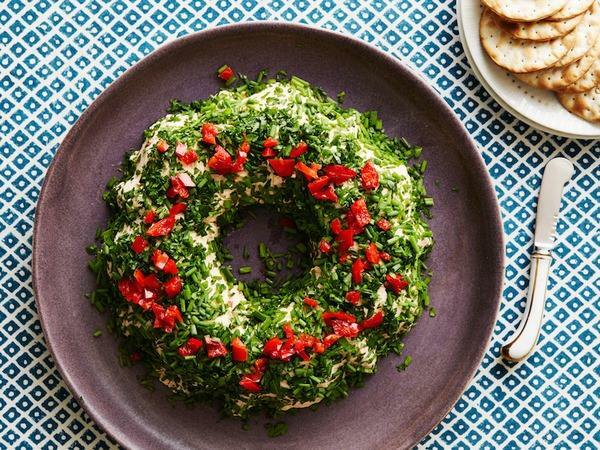 Edible Christmas wreaths are a complement to your festive table and we have selected some great recipes for delicious salads, appetizers and desserts. Like any holiday, Christmas has a certain list of traditional symbols – The Christmas tree, Santa Claus, reindeer, snowflakes, ornaments, snowmen, etc. 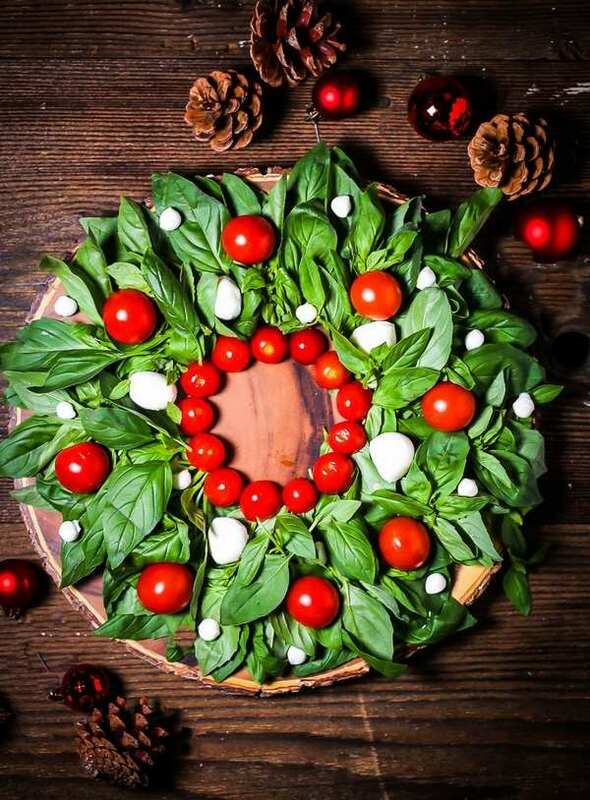 The wreath is among the most popular symbols and one of the most loved decorations. 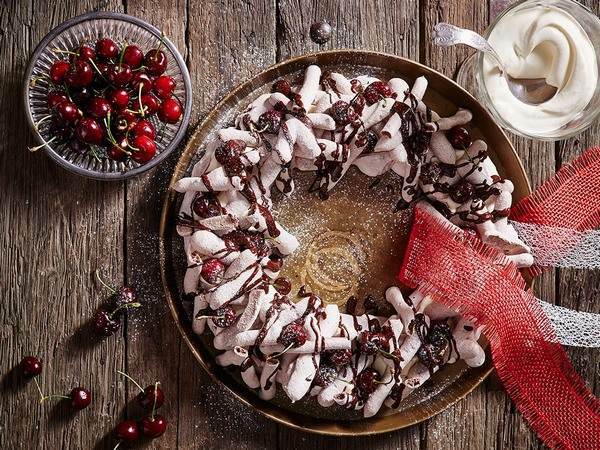 A Christmas wreath can be simple and elegant, handmade and purchased, modest and rich, bright and barely visible, but, among other things, it can be edible, and, you see, this is one of the most wonderful options! 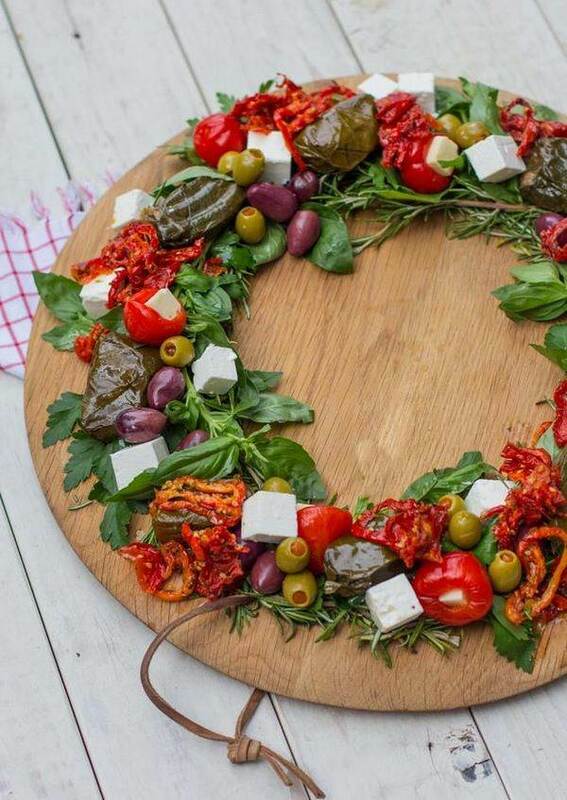 Sweet or savory edible Christmas wreaths? 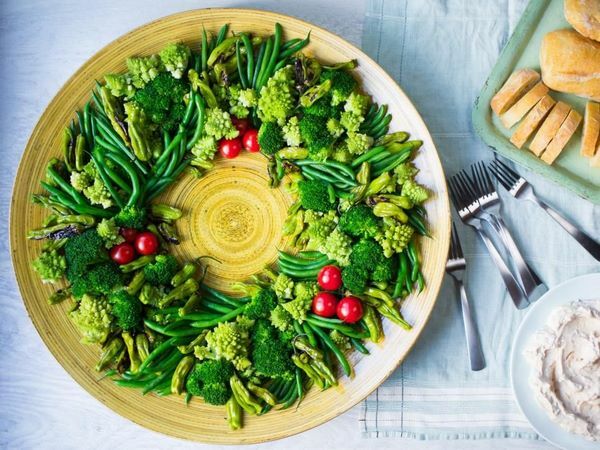 To create a lovely festive atmosphere on your table, it is not necessary to scratch your hands in an attempt to weave wreaths from fir branches. 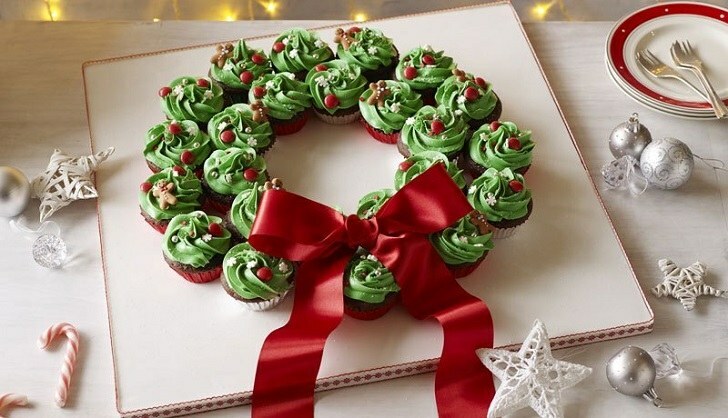 You can achieve the same visually pleasing effect but besides being aesthetically beautiful your wreaths can be delicious too! 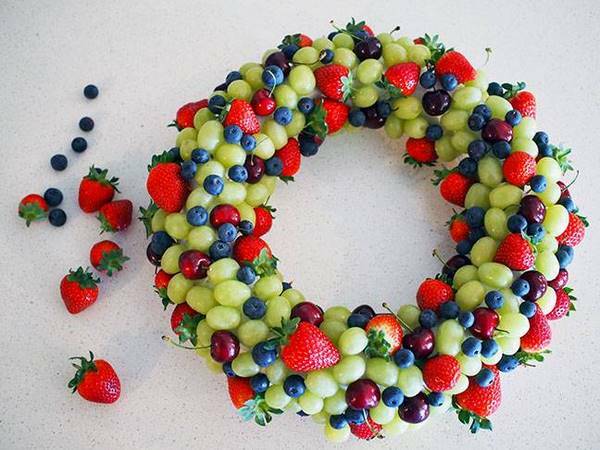 It is not difficult to make edible Christmas wreaths, all you need to do is to choose the option that is right for you and your family. 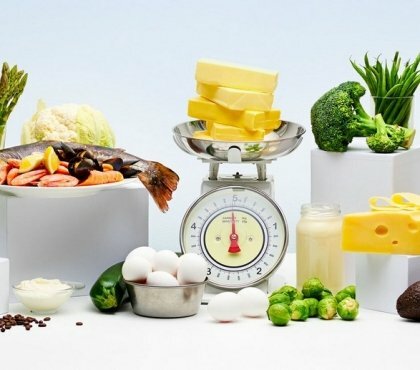 What do you prefer – baking, cake, salad, jello? 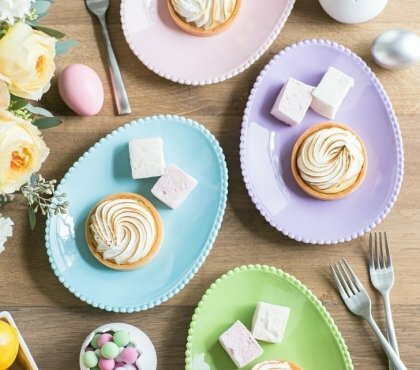 Of course, children love desserts and adults prefer salads and appetizers. 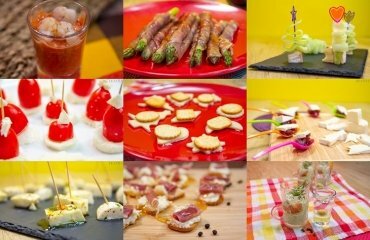 You can easily prepare different options for your Christmas dinner or if you plan a party, you can arrange the bites in creative and original way. Well, we shall give you recipes and ideas for both options. 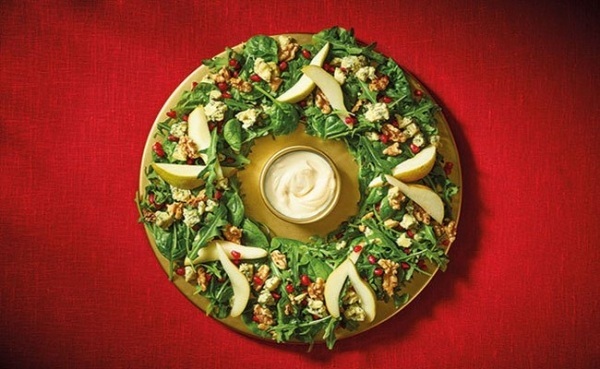 Snacks and salads arranged in a wreath form are the easiest way to arrange food elegantly. It is important to choose greens or vegetables with rich colors – arugula, asparagus, broccoli, tomatoes, red bell peppers, radishes, etc. 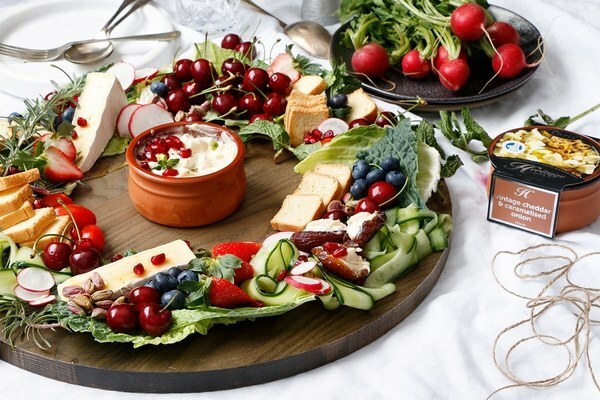 Choose a wide platter or serving dish. Place the dressing in the center and all the ingredients around it. 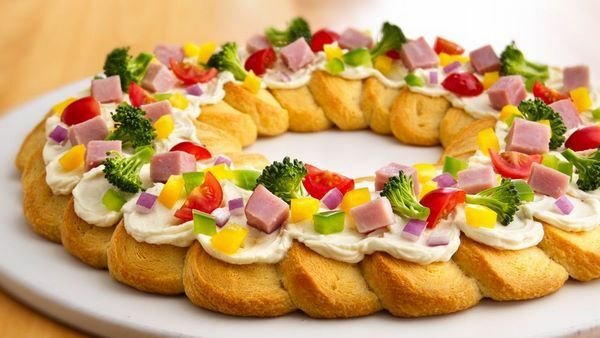 Baking and bread – arrange your dinner rolls in a circle and bake them in the oven. What can be easier? 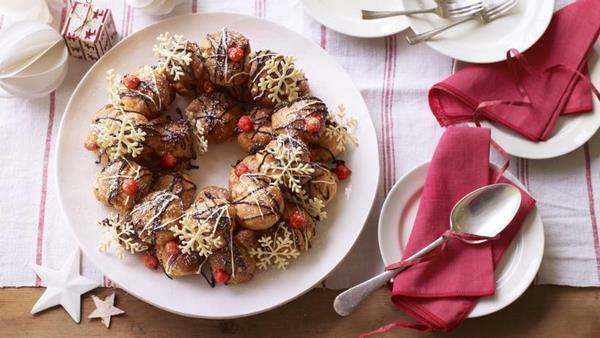 Desserts are the final touch to any feast and you can win the applause of your Christmas dinner guests with an original recipe. Choose a pudding form with a hole in the center or a bundt cake form. 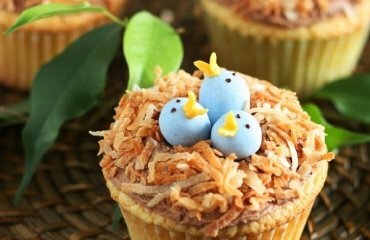 Pour the dough into it, and after baking, decorate with additional ingredients. 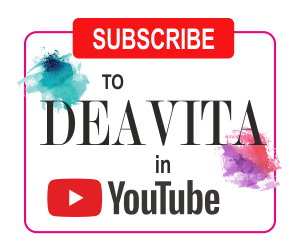 An easier option is to buy cupcakes from a bakery, arrange them in a circle and decorate with fresh berries, fruits and mint leaves to your liking. So, let’s make your Christmas more beautiful and delicious! 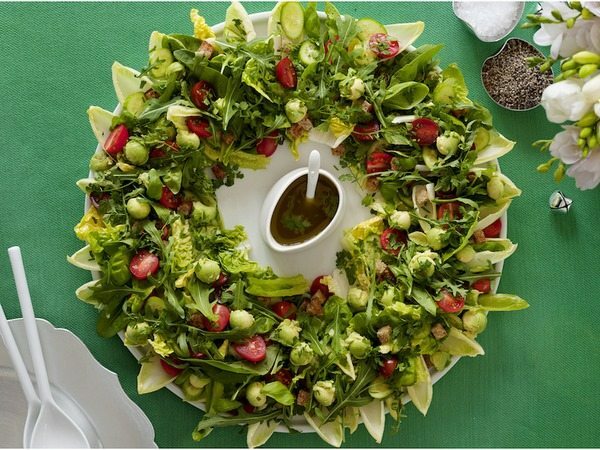 Arrange the mixed leaves in a circular pattern. Add cherry tomatoes and bocconcini on top. Finely slice some basil and then decorate with some of the prettier leaves. 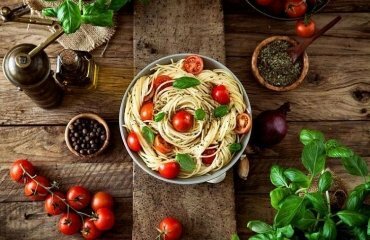 Whisk the olive oil and vinegar together and dress the salad. 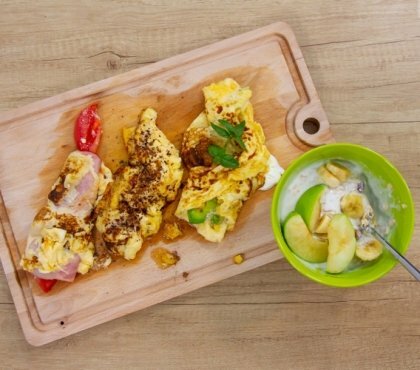 Blend avocado dressing ingredients together for 1 minute, or until smooth and set aside. Arrange arugula, pomegranate seeds and 1/4 cup crumbled feta cheese on a plate. Drizzle salad with avocado dressing. Place the ingredients for the dressing in a small bowl and whisk until smooth. Blanch asparagus spears in boiling water for 2 minutes and plunge them into cold water. Slice half of the strawberries. Place a small bowl in the center of a large serving platter or board. Scatter the salad leaves around the bowl and layer the asparagus on top of the salad leaves. Place the sliced strawberries on top. Crumble the feta cheese on top of the leaves, asparagus, and strawberries. 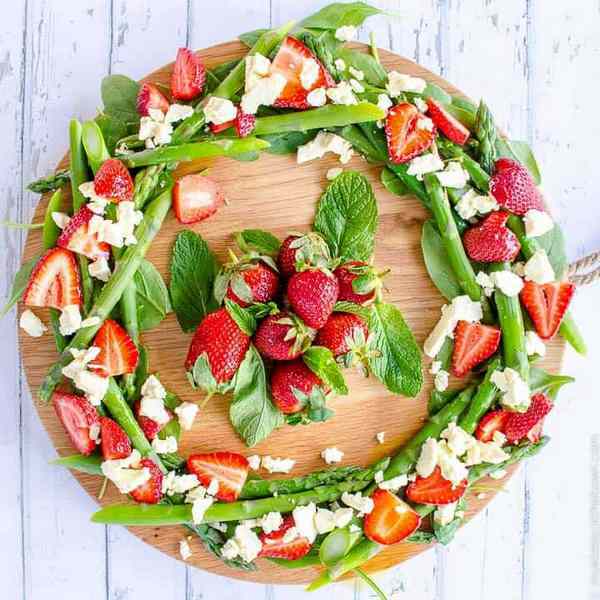 Remove the central plate and use the space to arrange the remaining whole strawberries and mint leaves. 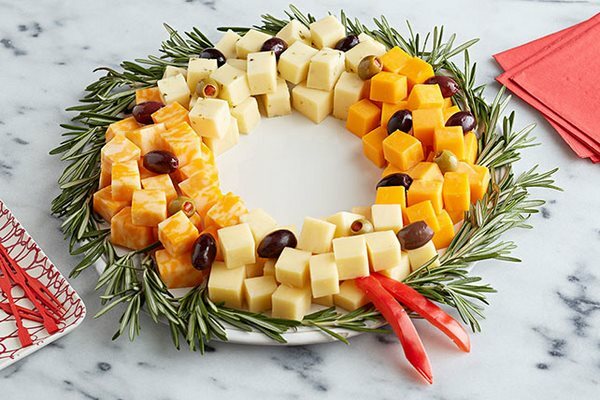 On a large plate, arrange cheese cubes into a wreath shape. Arrange tomatoes on top like ornaments. 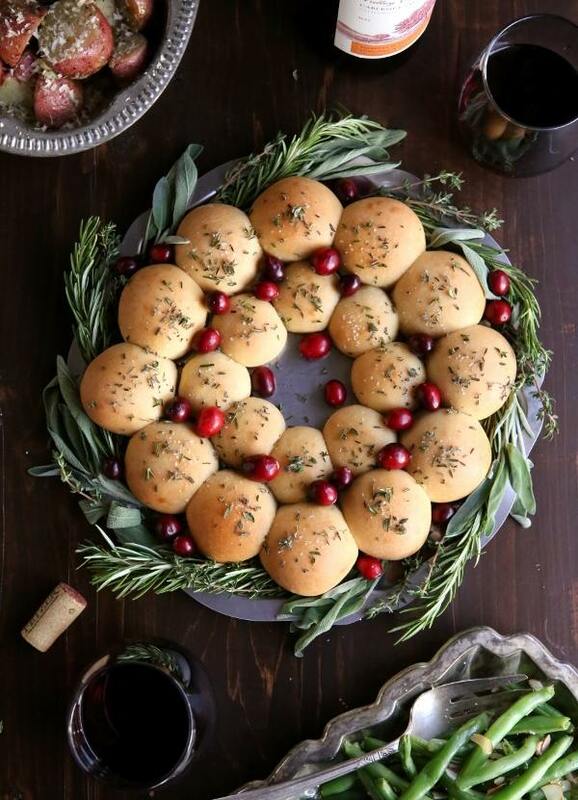 Use sprigs of rosemary to surround the cheese wreath. 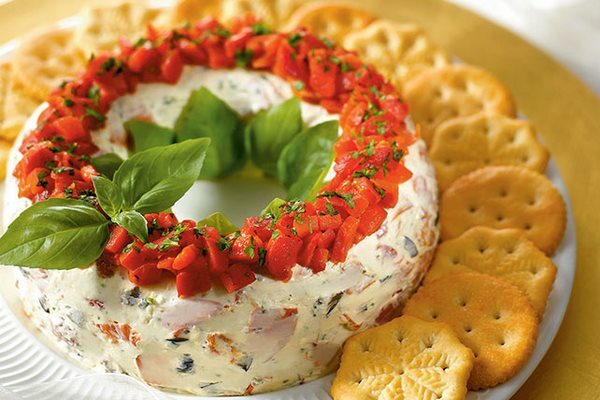 Cut a bow from the red bell pepper and place it at the base of the wreath. 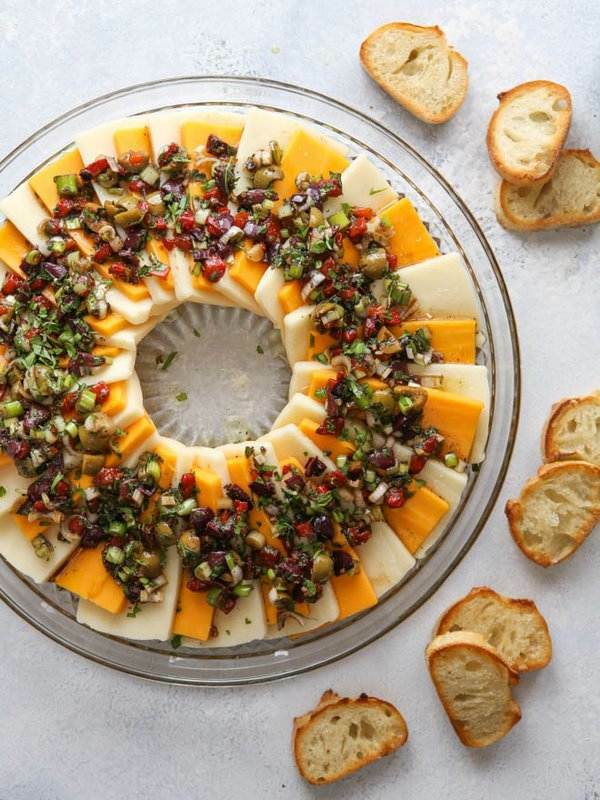 Arrange cheese slices in a ring on a large platter. In a bowl combine the remaining ingredients and spoon over the cheese slices. Cover with plastic wrap and chill for at least 4 hours and up to overnight. Serve with toasted bread or crackers. In a small saucepan set over medium low heat, warm the butter, honey and milk until butter is melted and mixture begins to steam. Make sure it does not boil. Remove from heat and let sit 5 minutes, or until the temperature is between 120-130 degrees F (48-55C). In the bowl of a stand mixer fitted with a dough hook, combine 1 1/2 cups of the flour with the yeast and salt. Add the milk mixture and mix until combined. Add the eggs one at a time, mixing after each. With the mixer on low, add the remaining flour 1/4 cup at a time until dough clears the side of the bowl but is still slightly sticky to the touch. You may not need all 3 1/2 cups of flour. Continue to knead the dough in the mixer until it is smooth and elastic, about 5-8 minutes. Place dough in a greased bowl, cover with plastic wrap, and let rise in a warm place until doubled, about 1 hour. 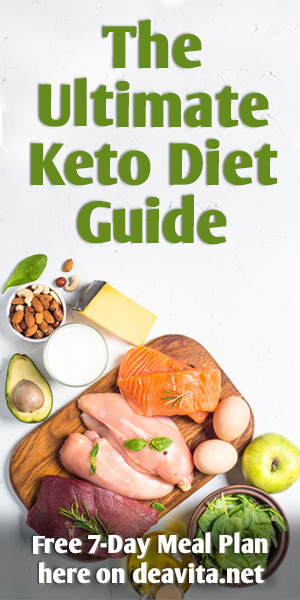 Trace an 8-inch (20 cm) circle onto a sheet of parchment paper and place on a 11×17-inch (27×43 cm) sheet pan. Gently punch down dough and knead a few times. Pinch off one third of the dough and set aside, covered in plastic wrap. Divide the rest of the dough into 12 equal pieces, shape into balls, and place on the prepared sheet pan on the traced circle. Divide the reserved dough into 9 smaller pieces, shape into balls, and place on the sheet pan inside the larger balls. Cover rolls with plastic wrap and let rise in a warm place for 30-45 minutes. Meanwhile, preheat the oven to 350 degrees F (180C). Brush with egg wash, if desired, and bake the rolls until golden, about 20-25 minutes. Immediately brush with melted butter and sprinkle with fresh herbs and coarse salt. Let cool for at least 15 minutes. 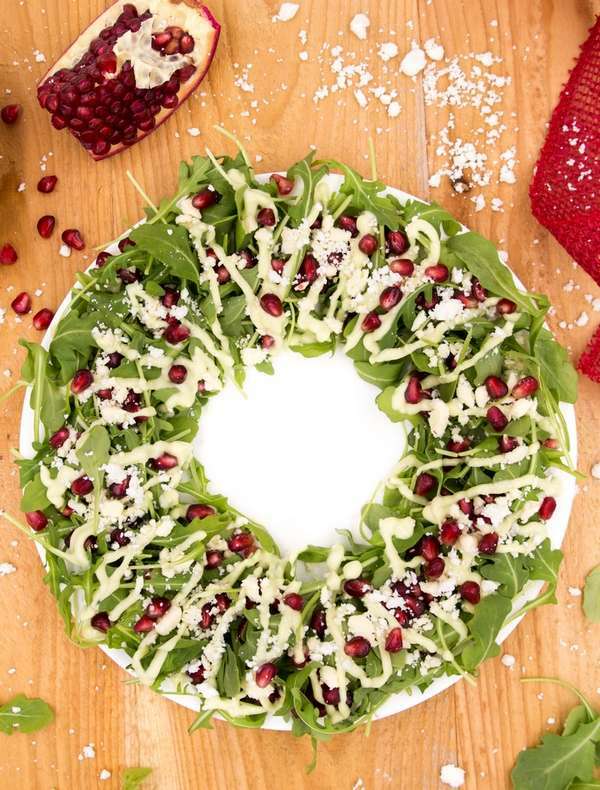 Gently transfer roll wreath to a 10-inch or larger serving platter. Garnish with sprigs of fresh herbs and fresh cranberries. Draw a 10- inch (26 cm) circle on a large piece of baking paper and another 4-inch (10 cm) circle inside it. Place ink-side down on a large, greased flat baking tray. Preheat the oven to 270 degrees F (130°C). 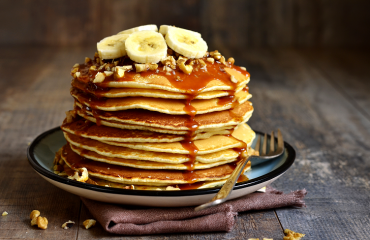 Whisk the egg whites to soft peaks then gradually beat in the sugar, 2 tablespoons at a time. Keep whisking until the sugar has dissolved and the meringue is thick and glossy. Add the vanilla and lemon juice and beat for 2 minutes. Place 12 large, heaped spoonfuls of the meringue around the inside of the circle, making sure they are touching. Leave the inner circle empty. Use the back of a spoon to make indents in each meringue where the cream will sit. Bake for 1½ hours until the outside and base are crisp. Turn off the oven and allow the meringue to cool completely in the oven. Whisk the cream, mascarpone and vanilla together to soft peaks. 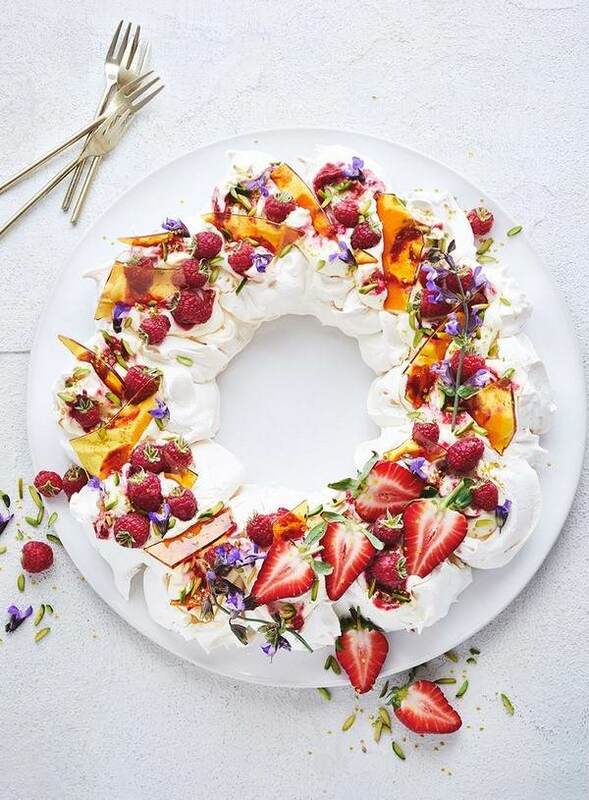 Dollop over the meringue and garnish with any of these – fresh berries, chopped nuts, praline or toffee shards, edible flowers, pomegranate seeds, edible gold or silver stars. Preheat the oven to 200C/180C Fan/Gas 6. Line three baking sheets with baking parchment. Put the butter into a heavy saucepan with 250ml/9fl oz water and heat over a medium heat until the butter melts. Bring to the boil. Remove from the heat and add the flour. Stir vigorously with a wooden spoon until the mixture forms a soft ball. Cook over a low heat for 2–3 minutes, stirring constantly to dry out the choux. Leave to cool slightly. Tip into the bowl of a food mixer with a whisk attachment or use an electric hand whisk. Gradually add the eggs, whisking well between each addition, to form a smooth, shiny paste. Spoon the mixture into piping bag fitted with a ¾ inch (1½ cm) plain nozzle. Pipe twelve small mounds onto each prepared baking sheet (giving a total of 36 mounds). Dip your finger in water and gently smooth the top of each mound. 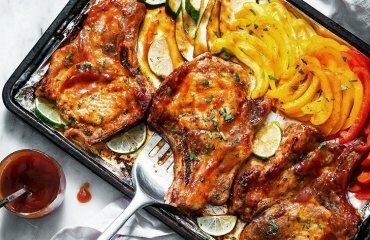 Bake for 20-25 minutes until golden-brown. Let cool completely on a wire rack. Pour the milk into a heavy-based pan and bring to a boil. Remove from the heat and leave to cool for 30 seconds. Meanwhile, in a medium bowl, whisk together the egg yolks and caster sugar until pale, then whisk in the cornflour, cinnamon and nutmeg. Pour the milk over the egg mixture, whisking continuously, then pour back into the pan. Bring to a boil, whisking continuously over a medium heat and cook for a minute. Remove from the heat and pour the crème pâtissière into a bowl. Cover the surface with cling film to prevent forming a skin and leave to cool. Cut the chocolate into pieces and place in a heatproof bowl. Pour the cream into a pan and heat until simmering. Remove from the heat and pour over the chocolate. 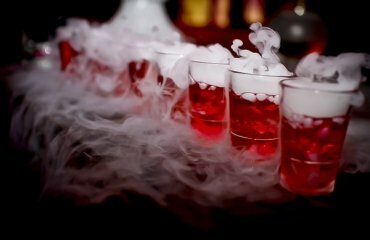 Stir until the mixture is smooth. Leave to cool until thick enough to drizzle. Boil the caster sugar and 5 tablespoons water together in a pan until it turns golden or reaches 170C on a sugar thermometer. Remove from heat and leave the caramel to thicken slightly. Whip the double cream to soft peaks and fold into the crème pâtissière. Spoon into a piping bag fitted with a long thin nozzle. Fill the choux buns with the crème pâtissière. On a large cooling rack arrange a circle of fourteen choux buns so they are all touching and place ten choux buns inside the circle. Carefully dip one side of each choux bun individually into the caramel and glue to the bun next to it. Continue until the two circles are joined together. Dip the base of the remaining twelve choux buns in caramel and stick them on top of the circles. 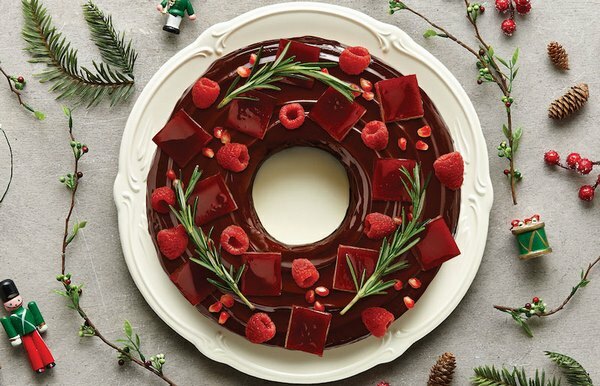 Finally drizzle the wreath with one quarter of the chocolate ganache. Transfer onto a serving plate and decorate with chocolate snowflakes, caramel hazelnuts, edible gold or silver stars, etc.